Will you allow me a moment to complain? Or at least a bit of a vent? I promise to reward you with photos and happiness later on. Teaching third grade is time consuming and really hard. Hats off to all those that do it and love it. It requires so much more planning than the one subject courses I have taught in the past to older students. As a world geography teacher for both high school and community college levels, I could teach full time and get my lessons planned within a 45 hour work week. Designing four subjects for my little munchkins seems to take me upwards of 60 hours. Then of course there is the after school club once a week (I’m co-chairing the school Newspaper) and of course I offered my services to teach adult ESL twice a week. So I have definitely filled my plate nice and full. I had forgotten how draining it is to be “on” all day long. No sitting at my desk drilling into a problem. The few moments between 8:30 and 3:30 (or 8:30 – 5:00 on M/T) when I am not teaching, I am correcting papers, devising alternative plans for my struggling students, speaking with parents etc. I know. Blah, blah, blah. Every teacher in the world knows this. But I guess I felt the need to mention my revelation because I have been feeling so down for the last couple of weeks. I suppose its just stress, but in reality I think it is the fact that I haven’t been breathing the proverbial Myanmar air. I have been feeling very removed from the culture. I think living on campus is a huge part of the problem. We (all of us foreign teachers) live in free accommodations built right on the small campus grounds. So we never really leave. Of course we do, but its not like going home to your own place surrounded by the culture you are here to be apart of. I can’t complain too loudly – it is free accommodation. But I have been missing the connection with the heart beat of this place. So to remedy my disconnected feelings I spent yesterday alone. Ha! I’m not sure that is possible here. I was sans-foreigners (not that we are all that bad :-)) and instead surrounded by this wonderfully rich and diverse populace full of smiles, giggling children, outrageous juxtapositions, wonderfully spicy smells, monks with iPhones, and a rich history oozing from its very core. Let me tell you how I jump started my good-feeling, glad-to-be here mood. I woke up with the sun and lazily laid there listening to the birds that nest right under my window. They are a happy little chattering lot. By 8:30 I had motored over to Mandalay Hill, removed my shoes and started the steep climb to the top. Climbing on stones barefoot is amazing exercise for your calf muscles. Along the way I met numerous people selling their wares, making the trek to pray, snuggling with their sweetheart and children running up and down as if we were on a flat sidewalk. 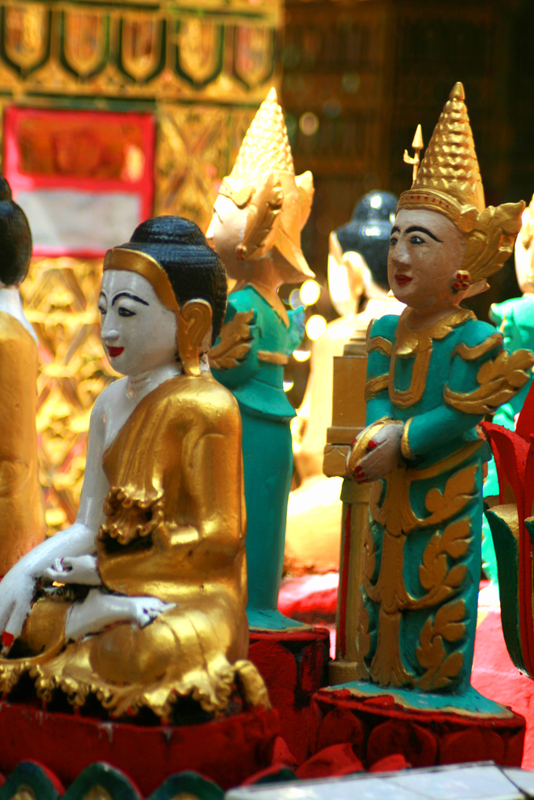 At various spots there are platforms with a variety of Buddhas in different states of repose. Buddha must have been a joy to be around. He is always depicted with such a gentle and serene gaze and sometimes with an outright smile. I thought I had reached the top about four times. But just as soon as I started to relax and look for the promised vista, some smiling, bowing soul would see me and motion me onward. Its a bit of a maze in the middle. Then just before the top you enter into the trinket zone. T-shirts, bamboo flip-flops, bamboo purses, jade jewelry etc. Just as I was starting to fear that I would never escape, but be circling the stalls for years, I spied yet another staircase and up I went and this time I was greeted with the flashing of gold and cut glass. The cool breeze swirled around me and I was lifted out of the trees to a near 360 degree view of the Mandalay valley and surrounding Shan mountains. It was a bit of nirvana. 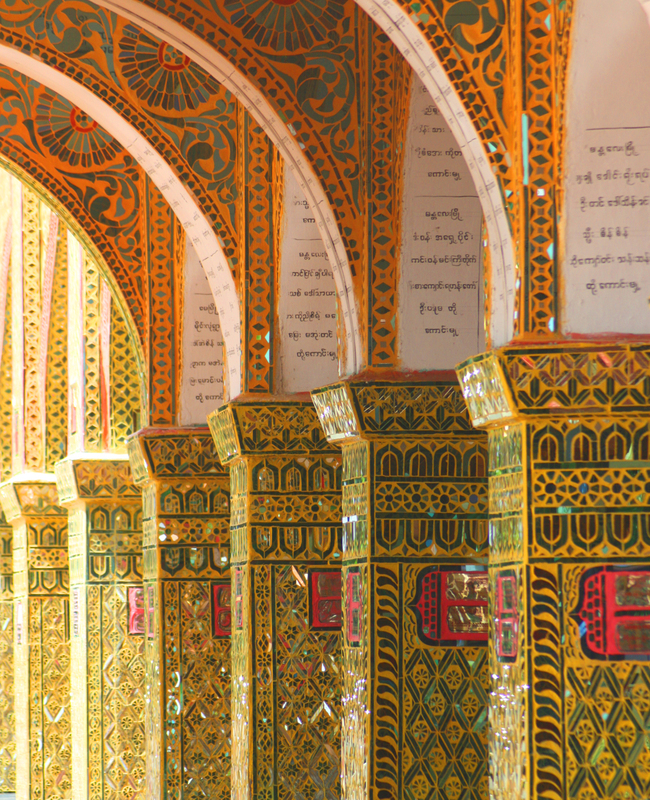 Beautiful arches at the top of Mandalay Hill. The temperature was at least 15 degrees cooler than the valley floor. The whipping wind was a joy. After photos and a wondering I just sat, leaned back against the gold, facing west and the Ayeyarwaddy river. I breathed deeply and smiled, well smiled mostly because I was such a spectacle that everyone was smiling at me, so it only felt right to oblige and smile back which resulted in giggles and blushing. 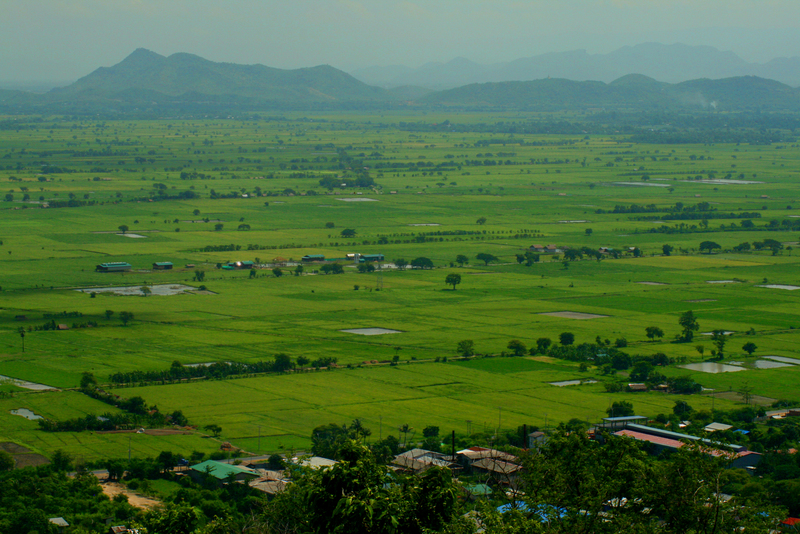 Looking NW from Mandalay Hill. Mandalay city is on the other side of Mandalay Hill. 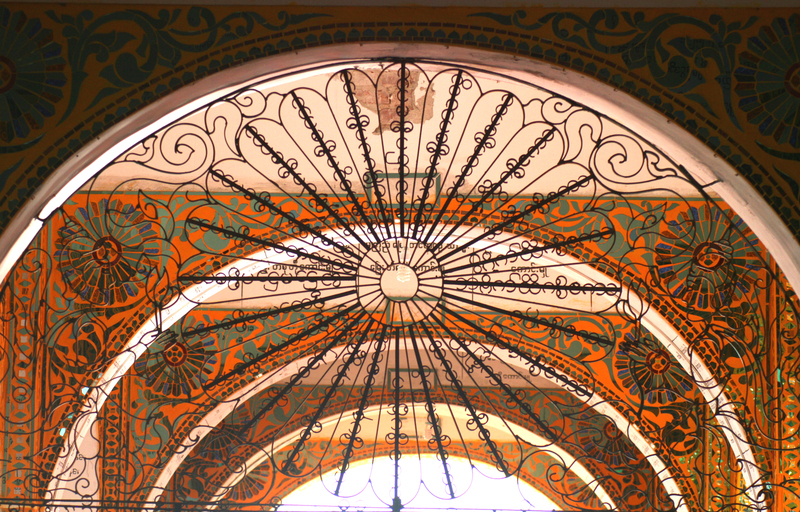 In most of the Buddhist temples there is swirling iron work that I have really been enjoying, especially next to the brilliant colors of paint and gold leaf. After an hour or so I found the view of the Palace below was beckoning to me. I had to go explore its expansive interior. Although burned out extensively during World War II, much has been reconstructed of the palace itself. I am currently reading The Glass Palace by Amitov Gosh, an historical fiction novel. 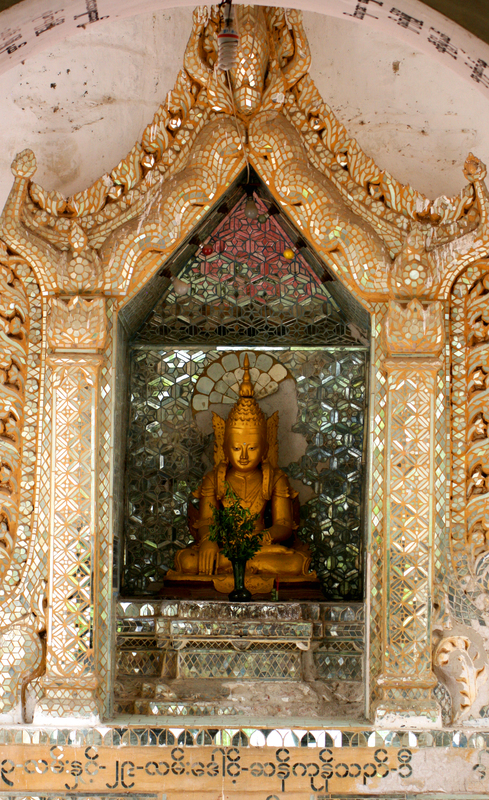 The palace is known as the glass palace due to King Thibaw’s bed made of glass bedposts. Inside the palace grounds there is a small museum and it houses his glass bed. Quite unique. I motored over to the palace, over the moat bridge (good sailing weather by the looks of the white-caps on the moat!) and parked. I could have driven in, but I wanted to fully feel the immensity of the grounds. Foreigners are only allowed to visit a very small portion of the grounds as the military has taken over the walled in location. Never the less, I walked among tall trees, with little disturbance from the dust and grim of the city. I met three very nice monks visiting from a city far in the north. Walking makes it so much easier to meet people. The main palace first came into view. It was hard to get a full photo of it. The grounds are full of residences of the once thousands of people that lived and worked for the royal family. After wandering through all the residences and council houses, I climbed to the top of the “Watch Tower” – the spiral staircase in the photo above. The trees have grown so tall that it was hard to see very far, but the photo of me is from the top. The black and white photo is of King Thibaw and Queen Suphayalat. I loved all the detailed wood carvings on each of the buildings. 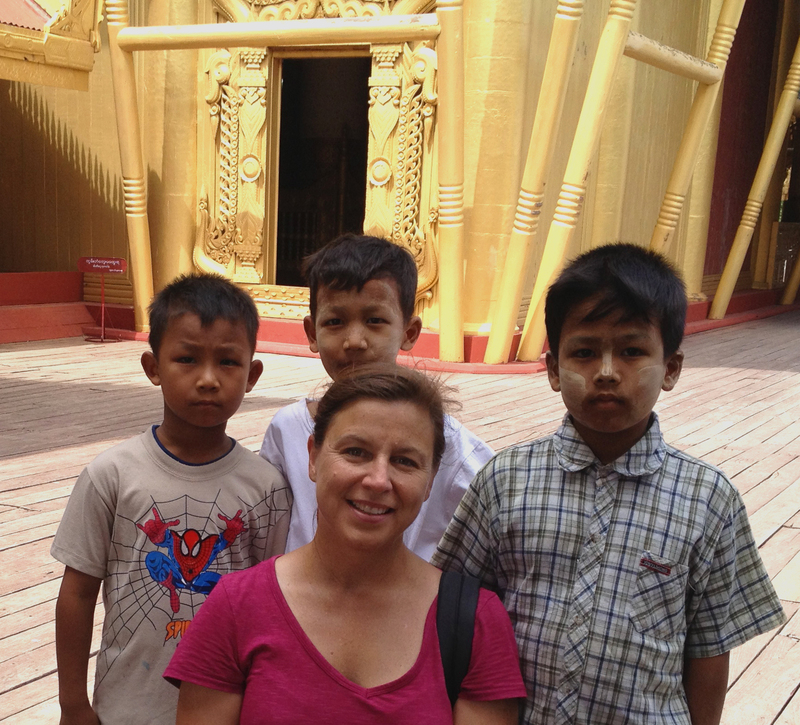 While sipping ice-cold water purchased from the vender at the base of the Watch Tower, I was joined by a happy family with three adorable boys. They were all smiles and racing to and fro. The wind was really whipping at the top and although it felt great, you could really feel the Watch Tower sway. I took a few photos of the boys and then out came their phones and we had a full on photo shoot. Funny how we are all so excited to take photos of each other – complete strangers. But all our silly grinning and happiness just filled me up. I think when this picture was taken was the only time these boys weren’t grinning from ear-to-ear. They were such happy souls. As I started to motor home, sticky, sweaty, filthy… I decided to make a stop to get my toes polished. Why not? Other teachers had done this, so I thought it would be no problem. Well, it was a HUGE deal to the gals that I popped in on. I had 12 girls, many with orange-ish hair, apparently that is as close as the bleach here will get there lovely black hair, trying to decipher what I wanted. No, I didn’t want a fancy design on my toes. Just color. That, I, was very strange. They said the polish gal was on her way, so while we all waited they just sat around and stared at me, smiling, giggling, staring. At first it was tiring and I was getting grumpy. But I wasn’t on a main street and this probably had never happened to them before. I had to remind myself that I must seem very different to them. With that I got over my “I’m tired of being stared at” attitude and started smiling and trying to engage them. Might as well try and make a happy and lasting impression. Soon the polish gal came and within 5 minutes my filthy feet (remember I had walked to the top of Mandalay Hill without shoes on that morning) had new polish on them. No foot soak and no leg massage. Simply wipe off the old, clean a bit of dirt of the nail and re-polish. Then a hand fan and some physical leaning over and blowing on the toes and I was on my way for a whooping $1.00 – yep, one dollar. With bright toes encourage my new serenity, I motored home, took a quick shower and was out again with a fellow teacher to have cocktails and watch the sunset over the Ayeyarwaddy river and then to listen to a local band sing mostly foreign songs in Myanmar. What a fantastic day! New energy and a determination to SEE all the little, beautiful things that surround me each day, its a good way to start the week. Just riding to a place where I could write this blog today, I was once again seeing the arching trees, the vibrant colors and the uniqueness of the people again. Feels good. It is so hot in Portland this week 90-100 and so I could almost feel how wonderful the wind was for you atop the tower. Your story was great and what is more wonderful is that you are shaking yourself out of your lowness and making things work. You are an inspiration! Teaching can be overwhelming and blinding to a life outside the duties and lessons. It will get easier for you. First year is always the roughest. Love to you — think of you often!